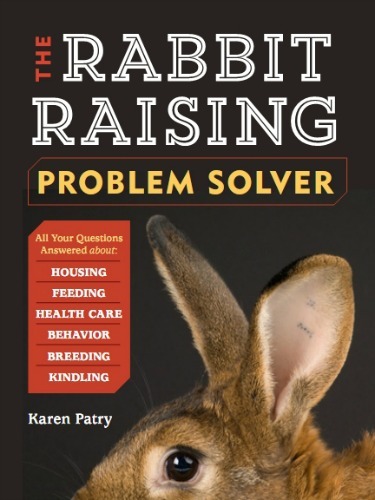 October Rabbit Breeding: Did the Doe Get Pregnant? THIS doe is certainly pregnant! My 2nd doe a chocolate had come of age and I bred her with my lilac buck. I bred them this past weekend and they successfully bred several times. I say that, because it was a major difference from what happened when I put my black buck and grey doe together again, unlike last time she didn’t seem interested at all and would just sit there and not cooperate at all. I helped one time hoping to do what they call a force breed and that one time he seemed to have been finally successful, but I’m not 100% sure. I decided to wait a couple of days and try again, This time she at first seemed more receptive and comfortable, however the minute he tries to mount her, she grunts, which was a first for her. She definitely wasn’t having anything to do with it this time and the buck didn’t even try much either. I have to wonder if the grunting means she’s already pregnant or my fear is that she will never breed or my buck has issues. My rabbits are of the dutch breed and are all pure bred. I’m also concerned that if she doesn’t have babies soon she never will because of age. What are your thoughts? Do you think she’s pregnant already? First, let's revisit the initial breeding in the summer. There is a difference between a false pregnancy and a failure to kindle due to heat-induced buck infertility. In the first case, a doe ovulates due to any of several reasons, including you stroking the doe’s back, or even the smell of a nearby buck. But without the presence of sperm, no pregnancy can take place. In the case of an infertile buck, a mating takes place but the sperm count is minimal or the sperm are dead. The doe may or may not experience hormonal changes of pregnancy. The outcome of these two conditions is similar: no babies. One of the above conditions happened to your grey doe. Thinking the problem was the buck, you waited a few months to rebreed. If I followed the information you provided, your doe by now is only 9 months of age. If so, she will be capable of conceiving and kindling litters for at least another 2 years, possibly 3 years. So, no need to worry about your doe’s age just yet. So, recently you tried to rebreed the black and grey pair. The doe was not eager to breed, but a little encouragement from you seemed to result in a single successful mating. You attempted a repeat breeding a few days later. The doe was very cranky by this point. If it were April in Macon, Georgia, I’d bet a whole lot of money on a “yes” answer. Her crankiness, growling, and unwilling attitude with the buck are certainly signs of a pregnancy. But, it is October. That fact alone turns a “yes” into a “maybe,” and here is why. Autumn brings another factor into play – the normal rest period that domestic rabbits experience for 2-3 months in Autumn. That rest period is triggered by reduced nutrient levels in their forages along with waning hours of daylight. These two signals combined result in low hormone levels in both bucks and does. For a brief period in the wild, all animals, bucks and does alike, live together peacefully. Bucks don’t fight with bucks, and don’t attempt to breed the does. They all just lounge around stuffing themselves on anything they can find to eat, which rebuilds their bodies for the next year of intensive reproduction. Because these signals are hard-wired into the rabbit’s genetic makeup, your doe may or may not have gotten pregnant last week. And when you tried rebreeding, she certainly signaled her disinclination to mate. Was this due to the fact she only wanted to chill for the next couple months? Or was that the crankiness of a genuine pregnancy? OR: had the force-breeding resulted in a false pregnancy? This is why it is only possible for me (or you) to arrive at "maybe" for an answer. Is your doe pregnant? You’ll know for sure in 31 days, lol. In show and production herds, the manager can take measures to minimize the signals that result in a rest period. First: Augment the lights in the barn. Put bright lights on a timer and set it for 15 hours of lighting. Second: Ensure excellent feed. 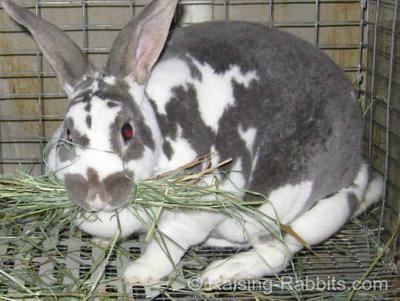 With fresh, complete feed, the rabbit’s nutrition levels remain high, and the physiological need to rest the body from the rigors of kindling and weaning can be minimized. And, the bucks will remain fertile. If 35 days go by without babies, add lighting, and reevaluate your feed for freshness. Try adding some whole oats or black oil sunflower seeds. And then try, try again.